The themes running in this one are very powerful. I'm going to track this one down for myself. Thanks for featuring and have a great week. I love the cover! And I haven't gotten the chance to go anywhere this summer :-( so this book sounds perfect for me! Thanks for the review! This sounds like a lot of fun! 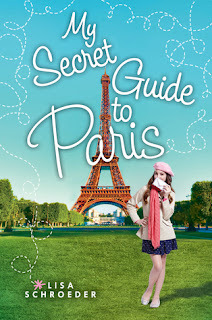 I love anything set in Paris. I met Lisa at an SCBWI conference years ago. She's such a sweet person, and I really enjoy her MG books. I didn't know she had a new one out. I'll have to read some of her other ones! I really did love this book. Everything about it was really well done. I would have liked this a whole lot better if grandma had just broken her hip. It was too sad to have her die. Bought a copy anyway, though! So true. But I think having the sadness helps kids when they have to deal with it themselves. Also, it let the Mom and daughter bond. I love the sound of this story. I've read Lost in Paris by Cindy Callaghan this Summer and enjoyed it. Lisa's book sounds similar but with the bonus of an intense mystery. I'll have to look for that one! !